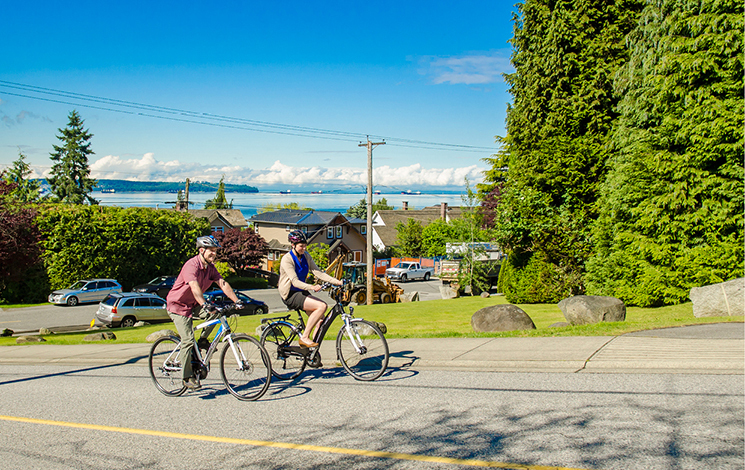 West Vancouver’s rugged topography, narrow meandering streets, abundance of creek crossings and steep elevation changes are a beautiful but challenging backdrop when it comes to transportation. No additional major roads are planned. Transportation is the second largest source of local community GHGs, but West Vancouver roads can accommodate more than just cars. With Blue Bus transit service and improvements in cycling and walking infrastructure, we’re trying to give people more options to avoid traffic congestion while reducing their environmental impact. Use of electric vehicles is also on the rise. West Vancouver has installed charging stations at Municipal Hall, the West Vancouver Community Centre and Gleneagles Community Centre.